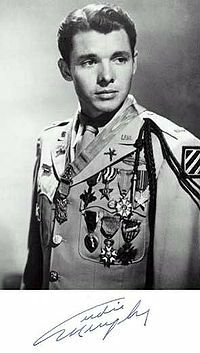 When Audie Murphy was twelve, the dream of fighting in the Army was his only relief from the poverty and back-breaking work of his Texas sharecropper family. He was one of nine children who all worked in the fields as soon as they were old enough to hold a hoe. While he was tending the crops, Murphy fought many battles, and he was always victorious and unharmed. Real life did not play itself out so easily. When Murphy was a young boy, his father left with no explanation and never returned. His mother died when he was sixteen. The three youngest children were placed in an orphanage, and the rest were forced to fend for themselves. Murphy worked in a gas station and radio repair shop, but he had a bad temper and got into fights often. He preferred to be alone, and only in solitude could he connect with his dreams. NOT GOOD ENOUGH FOR GOVERNMENT WORK On December 7, 1941, when the Japanese bombed Pearl Harbor, Murphy was 17 years old and more determined than ever to become a soldier. The day he turned 18 he went to the Marine Corps recruiting station to offer his services. He was rejected outright for being too skinny, which only added to his anger. His second choice was the newly formed paratroopers. They were a little more encouraging, telling him to come back after putting on weight. His third option was the infantry, even though he thought they were too ordinary for his ambitions. They accepted him as he was and shipped him off to boot camp. During the first close-order drill, Murphy passed out and was immediately dubbed “Baby.” To add insult to injury, he was transferred to cook and baker’s school. Refusal to do anything else eventually got Murphy a place back in the rank and file. In 1943 he landed in Tunis, Tunisia and then went on to Italy. Finally, his dream of being in combat was coming true. In Sicily, Murphy was moving ahead of his company with the scouts. Two Italians appeared, and instead of surrendering, they jumped on horses to escape. Murphy instinctively fired two shots and killed the two enemy soldiers. Murphy’s company commander made him a corporal. During a march to Palermo, covering 25 miles per day, he contracted malaria and was in the field hospital for a week. A DAY IN THE LIFE OF A SOLDIER After many more battles, some additional training and two more bouts of malaria, Murphy landed in France. His company was ordered to neutralize a hill that was an enemy strongpoint. Murphy and two comrades were bringing up the rear with enemy fire surrounding them. One of his partners died mid-sentence right next to Murphy, and the other one was killed when standing up to move. Murphy dove into a ditch and came face to face with two German soldiers. The split second it took for them to realize who they were looking at was enough of an advantage for Murphy to react, killing both of them. While he was making his retreat, Murphy exchanged fire with several Germans in various foxholes until his ammunition ran out. He found some fellow soldiers pinned to the ground by German fire overhead. Murphy dragged a discarded machine gun into a ditch and aimed uphill so the enemy had to expose themselves to shoot down to him. By the time he was ready to shoot, however, bullets were landing within a foot of his body. He let loose with fire in all directions trying to hit anything he could. There were cries of agony, and Murphy walked uphill to reconnoiter the area. He saw several dead Germans and one that he put out of his misery. When more gunfire attacked him, he emptied his weapon and waited. One of his buddies, Brandon, arrived, and as both men started walking in the ditch, they were attacked at point blank range. A bullet clipped off part of Brandon’s ear, but he was able to kill both attackers. The two American soldiers dove into a hole already occupied by two Germans, and killed them. Then Murphy and Brandon raised their helmets, inviting fire to reveal the enemy’s position. They lobbed two hand grenades toward the sound of the blast, and then there was silence. Brandon saw a white handkerchief waving and was convinced the Germans were giving up. Murphy cautioned him against responding to the gesture, but Brandon stood up to capture the surrendering enemy. In a barrage of bullets, Brandon fell back into the hole. Murphy was trapped with two German soldiers under him and his best buddy on top. With single-minded focus, he tried to move his friend, leading the way with a grenade. He sneaked behind the remaining Germans and made sure they were permanently incapacitated. Finally, there were no more enemy soldiers to confront. After removing the personal effects from Brandon’s pockets, Murphy sat next to his friend and cried until he was spent before rejoining his company. For his courage and commitment in many similar situations during three years of active combat, Murphy received 33 awards and decorations. He was awarded the Congressional Medal of Honor, the highest military award given for bravery. In an attack of six Panzer tanks and 250 infantrymen, Murphy mounted an abandoned, burning tank destroyer and used one machine gun to stave off the advancing enemy. Even though he was wounded in the leg, Murphy stayed there for almost an hour, fighting off the attacking Germans on three sides and single-handedly killing 50 of them. After rejoining his company, he organized a counterattack which forced the Germans to retreat. In addition, he received five decorations from France and Belgium. He is credited with killing, wounding or capturing over 250 enemy soldiers. In 1945 Murphy was 21 years old when he resigned from active duty. He had attained the rank of Second Lieutenant. LIFE AFTER WAR James Cagney saw Murphy’s photo on the cover of Life magazine and invited him to go to Hollywood. Murphy admitted he had little talent, and he struggled to get parts, sleeping in a gymnasium until he got a break and finally a contract at Universal. He found his niche in westerns and starred in The Red Badge of Courage directed by John Houston. In 1949 he published his autobiography, To Hell and Back, which proved to be a bestseller, and he starred in the film version of his story. The movie set a box office record for Universal that was only surpassed by Jaws in 1975. He made a total of 44 films. Murphy’s heart was always in Texas, and he owned a ranch there as well as in California and Arizona. He owned and bred Thoroughbreds and Quarter Horses, winning and losing fortunes gambling on them, and playing poker. He also discovered a talent for songwriting, and he wrote songs recorded by Dean Martin, Eddy Arnold and Roy Clark. In 1949 he married actress Wanda Hendrix, but the marriage only lasted a year. In 1951 he married Pamela Archer, and they had two sons. LIVING WITH THE NIGHTMARES Murphy’s combat experiences haunted him for the rest of his life. He suffered from “battle fatigue,” now known as Post Traumatic Stress Disorder, and slept with a loaded pistol under his pillow. In order to cope with insomnia and depression he became addicted to sleeping pills. To break the addiction, Murphy locked himself in a motel room for a week until he finished going through withdrawal. He advocated on behalf of the soldiers returning from Korea and Vietnam for better health benefits and treatment for mental health issues. On May 28, 1971, Murphy, 46 years old, was a passenger in a private plane when it crashed into a fog covered mountain near Roanoke, Virginia. He was buried with full military honors in Arlington National Cemetery. QUESTION: How do you feel about war? What ideals do you think are important enough to die for? Murphy, Audie, To Hell and Back. New York: Holt Rinehart, and Winston, 1949. I appreciate you bringing Audie to the public’s attention but you should make sure your facts are right. Audie was 15 when his mom died,16 when he tried to join up and just turned 17 when his sistet Corrine lied on his birth certificate.He did not have anger issues and fight with people except in grade school when he was picked on for having only 1 pair of pants that were too small for him. You made a few other mistakes on his war service stories as well. Try reading his autobiography and you will see and do some research. I am a died in the wool Audie fan and know everything there is to know about him and I admire,respect and love him. He was the very best,but still a man and human with flaws but oh so much courage.